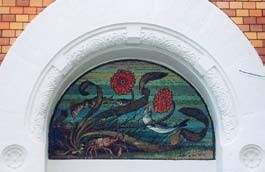 Style Moderne was the name for Art Nouveau in pre-Revolutionary Moscow, when the capital of the Tsarist Empire had been transferred to Saint Petersburg. At the turn of the century, a wealthy middle-class was seeking its own cultural expression that was different to the traditional eclectic historicism at the time, and it found this in new architectural forms. But this new language had a short life, because it was held in disrespect from the 1917 revolution onwards as it was considered to be an expression of bourgeois culture. The most important figure in Style Moderne was Fjodor Schechtel. He began his career within the context of a neo-Gothic architectural style, which was transformed into neo-Russian architecture, exemplified by the pavilions he designed for the 1901 Glasgow International Exposition, in which one can already note a predilection for new materials, combining wood with iron and glass. 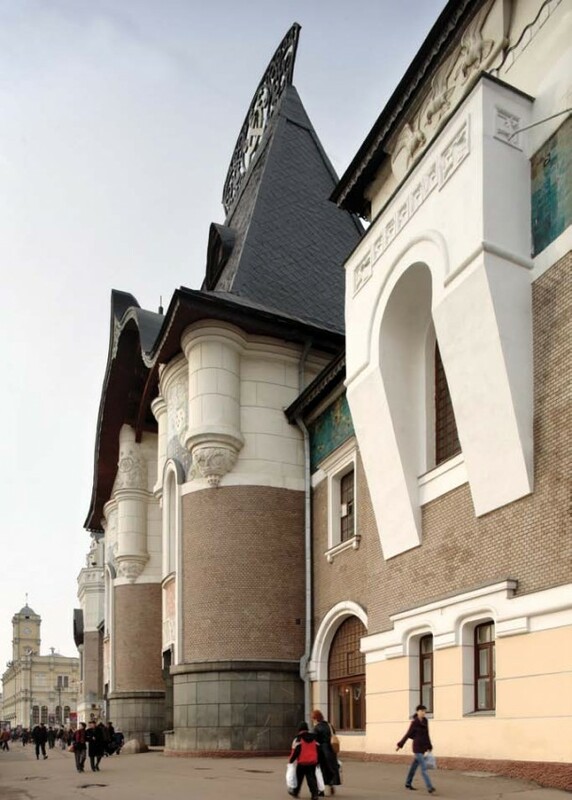 His extensive grey ceramic façades for the Yaroslavl train station (1902), which is crowned by a slender roof, are enriched by a colourful ceramic frieze with stylised geometric plant motifs. 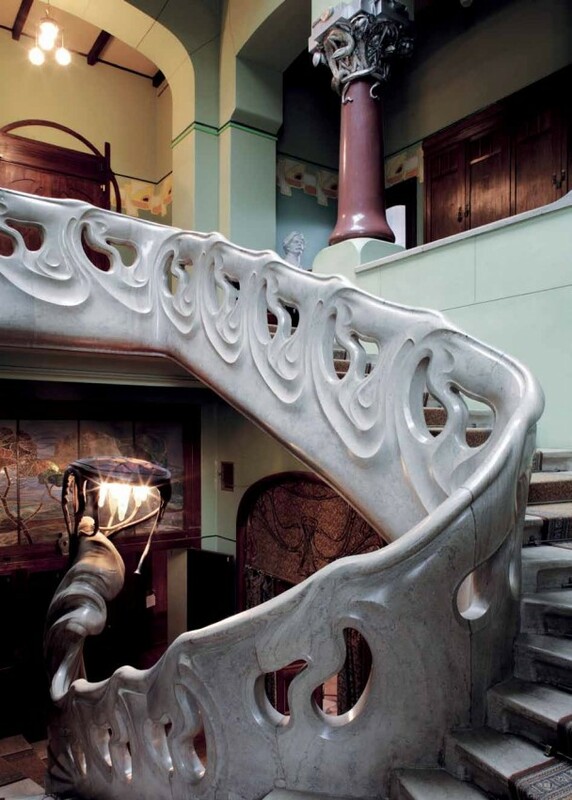 One highlight of the houses the architect designed for Moscow's new middle classes is the Ryabushinsky Mansion (1900-1903), now the Gorky Museum, considered to be the main exponent of Russian Art Nouveau architecture. The exterior is defined by clear volumes, cubic forms softened by decorative motifs derived from nature in a rainbow coloured mosaic frieze. The original decoration has been preserved inside, a highlight of which is the staircase, with its magnificent organically shaped banister. Similarly, in the Derozhinskaya Mansion (1901-1902), spaces have been organised around the central hall in an asymmetrical and functional manner, and its decorative arts are more geometric in shape. Another renowned architect, William Walcott, designed the grandiose Hotel Metropol (1898-1903), referred to by people at the time as the "Tower of Babel of the 20th century". Apart from the linear values of its iron elements, it has a large wall tile panel entitled "The Princess of Dreams" by Mikhail Vrubel and A. Golovin and a sculptural frieze dedicated to the seasons by Nikolai Andreev. 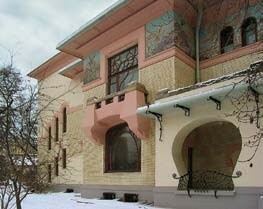 Still surviving today of the work of Lev Kekushev is the pioneering house (1898-1899) he built for himself at Glazovsky Pereulok 8, which is one of the first examples of Moscow's new architecture, and the house he designed for the textile industrialist Mindovski at Povarskaya Street, now the New Zealand Embassy.